MMJ Doctor Online is an online medical marijuana evaluation site, where California residents can supposedly be assessed by a state licensed doctor to get a doctor’s recommendation and MMJ ID card for medical cannabis. Their platform appears to be similar to other online evaluation services online (like our own, NuggMD), but deviates in several ways from legal standards and best practices. 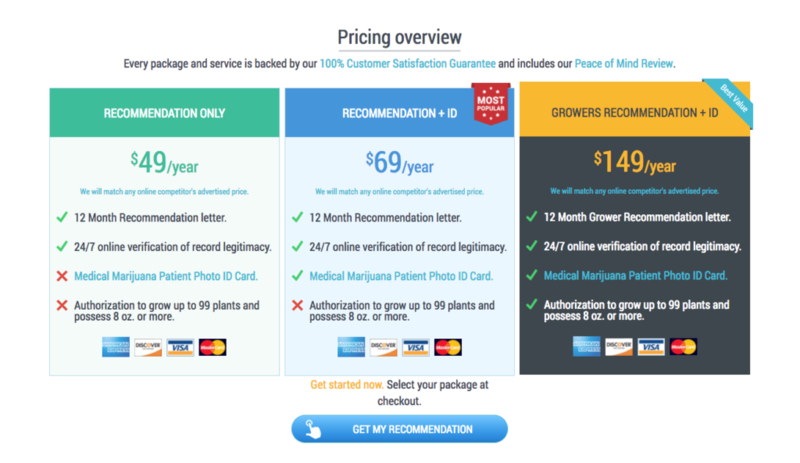 TIP: our prices for both a doctor’s recommendation and MMJ ID card are 20% cheaper than those offered by MMJdoctoronline.com. Click here to start your evaluation with NuggMD. Is MMJ Doctor Online Legit? Any Promo Codes, Discounts, or Referral Bonuses? Is There a Better Option for Getting an MMJ Card? On the surface, MMJ Doctor Online’s virtual evaluation process to get a doctor’s recommendation or to renew your existing medical cannabis recommendation looks pretty comparable to many other online MMJ doctors. However, there’s one major difference: there is no patient-doctor interaction. In fact, it appears to be a “pay to play” site, meaning you fill out the information, pay a fee, and are instantly approved. Anyone who cares about getting a valid and legal medical cannabis card should be very wary of this. California tele-health laws explicitly state that a doctor-patient interaction must occur for the standards of a “good-faith examination” to be met. While MMJ Doctor Online is theoretically one of our competitors, we will strive to be unbiased in our estimation of their service and base our review on their process, California law, our experience with their site, and most important of all, customer reviews. During the course of this article, we’ll take you through how MMJ Doctor Online works, and will compare the service side-by-side with our own online platform, NuggMD, which also offers you the opportunity to get your medical cannabis recommendation and card in under 20 minutes. 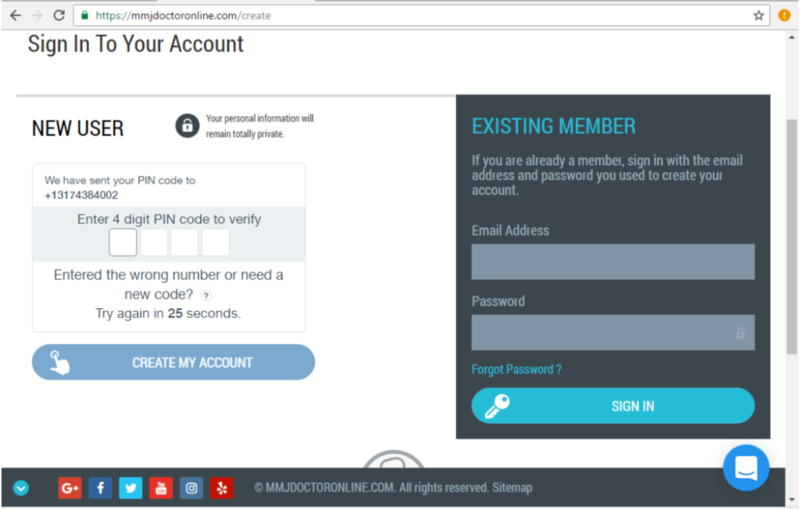 The mmjdoctoronline.com process begins by creating an account. You start by entering for which state you need a recommendation (they list quite a few states, but they really only offer the service for California and Nevada which makes the large list a bit misleading). You then provide your email, a password, and a phone number. They then text you a pin number which you have to input at the next screen in order to move forward in the process. Next, before entering any information, you choose the package you want. The “Recommendation Only” package is $49 and just includes the recommendation. The “Recommendation + ID” package for $69 includes the recommendation and photo ID card (commonly referred to as a medical marijuana card). The “Grower’s Recommendation” package runs $149 and includes everything in the Recommendation + ID package with the addition of authorization to grow an additional 99 plants and possess 8 ounces or more. These packages are similar to sites like NuggMD, though MMJ Doctor Online does have a higher price-point. After choosing your package, you must upload your driver’s license or state ID card in order to verify you are at least 18 years of age or older, and thus, eligible for California’s medical marijuana program. Now you move onto entering your medical history, a short step that requires very little detail. The information you provide gives the doctor an idea of why you are requesting an evaluation for cannabis, but serves as the only information for which the doctor will evaluate your eligibility, since you won’t actually meet with one face to face or over the phone. 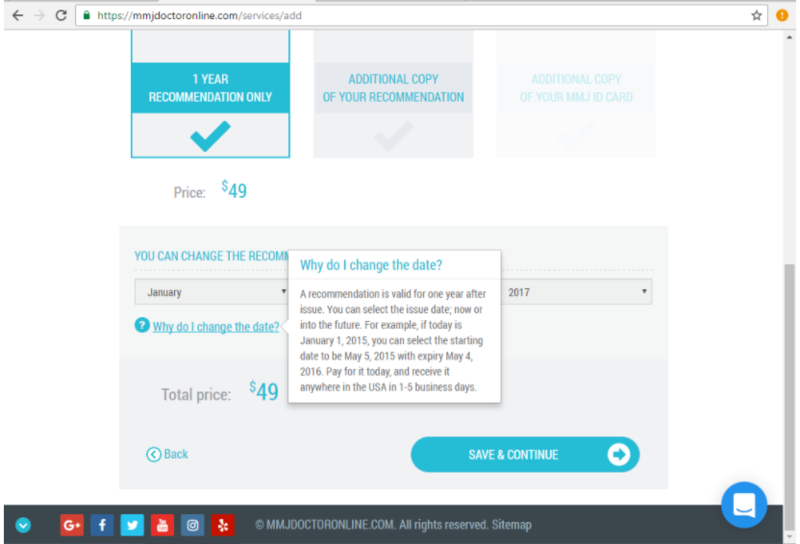 Just for comparison’s sake, NuggMD lets you decide if you want to provide additional information about your condition, but doesn’t require it. We know you may want to keep that information between you and your recommending doctor, and that’s just fine, since you’re actually able to discuss such information during your evaluation with a live doctor. But back to MMJ Doctor. The conditions area is also noticeably missing an “Other Conditions” box, which other sites offer in order to accommodate patients whose condition might not be listed. There is also no mention of family history or substance abuse on this medical history form, which lends to it being incomplete and potentially irresponsible, especially since patients will not actually talk to the recommending doctor. Next, you move to the additional services section where you can order extra cards, etc. But here’s where things get sketchy. The site gives you the option of changing your recommendation date, allowing you the option of post-dating the recommendation. We were pretty surprised by the information it contained. That made us feel like this may not be on the up-and-up. California law is very specific about the length of the recommendation and the requirement for the issue date to remain the same as the date of a patient’s evaluation. Legitimate? We’ll let you be the judge. Finally, you enter your payment information and place your order. Like many other sites, MMJ Doctor Online takes Visa, Mastercard, Discover, and American Express and is processed with a PCI-compliant payment processor. You’ll also only be charged once your recommendation is approved. Whether mmjdoctoronline.com actually employs doctors to review your application for medical marijuana will likely remain a mystery, but let’s assume they do have real licensed doctors at the other end of your application submission. They’ll review your case within 10-20 minutes based on the information you provided. Upon approval, you will receive an electronic, temporary copy of your medical cannabis recommendation. You will receive an electronic copy of your recommendation immediately, and then you will receive a physical or hard copy in the mail within 1-4 days according to the website (depending on where you look, they quote different time frames), though many Yelp! reviewers have waited weeks to receive it. Ouch. That can be a major bummer if you’re in need of meds. And another thing to watch out for. Your recommendation and card will not have an embossed seal, which almost all California dispensaries require. Many reviewers have had to go through the entire process again (spending more time and more money) with a site like NuggMD, which does provide an embossed seal, to be able to purchase cannabis in the dispensaries. IMPORTANT: Many dispensaries in California are under the impression that an embossed seal is required on your doctor’s recommendation; however, California state law does not legally require this. Even so, having a recommendation with an embossed seal assures that you’ll be granted access to any and all California dispensaries. When turning to online reviews to determine the quality of service provided by the company, we looked at their Yelp page, Facebook page, Weedmaps pages, and discussions found on Reddit and elsewhere on the web to make a best judgement. The remarks provided by Yelp reviewers and others range from very happy to very dissatisfied. While the overall average of the reviews is high, there are a few things a careful cannabis consumer should be wary of with this service. In repeated reviews, there were complaints about the timeliness of the card’s arrival. Several cards have been two or more weeks late, and customer service is unwilling to give a guaranteed delivery date or offer something else to “make it right,” despite the site’s supposed 100% satisfaction guarantee. Other customers didn’t receive their electronic copies immediately (or even within days) and were either treated rudely by customer service representatives, or weren’t contacted at all. Some reviewers also were not able to use their card or recommendation because it did not have an embossed seal. MMJ Doctor Online also promotes price-matching, but several reviews mention that they would not match other comparable sites. Unfortunately, there were also many five-star reviews that looked as though they may fake, although it’s tough to tell these days with nearly all online businesses having some percentage of fake reviews. We came to this conclusion after taking a look at the reviewers, most of whose profiles do not have a picture, friends, or other reviews written (or came from an account with just one or two). Some of the reviews also sound very “salesy.” Be wary. Yes and no. While a Google search will bring up potential codes, further research concluded many of them are from 2016 and have a low or no percentage of success. The company also doesn’t appear to have any partnerships with local dispensaries. 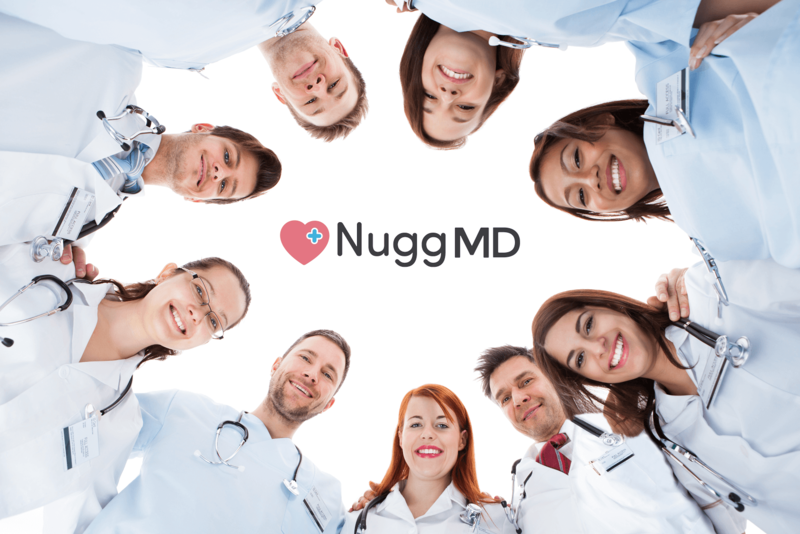 In addition to delivery services and a $20 first-time credit, NuggMD works with dispensaries who offer fabulous freebies and promotions to NuggMD clients. While MMJ Doctor Online does offer 420 evaluations and recommendations, it does so without any patient-doctor interaction. Instead, you fill out a form and are instantly approved, which frankly, is 100% illegal. Even though we’re tooting our own horn here, we strongly recommend you use a site like NuggMD for your medical marijuana evaluation needs. We give you access to a state-licensed, pro-medical marijuana doctor to complete your evaluation in a confidential and 100% legal manner. You’ll be able to talk to a doctor in real-time, ask questions, and determine if cannabis is the right choice for you, and we have customer support staff online every day from 8am-10pm to help answer any questions or quell any concerns you might have about the process. Just click on the blue bubble icon in the bottom-right corner of our site to chat live with our staff! NuggMD also provides raised, embossed seals on your recommendation so that you can shop with confidence that your documentation is entirely legal and will be accepted by every California dispensary. Did we mention NuggMD is also cheaper? We offer recommendations for just $39, and a recommendation + ID card package for $59. But get this. You can recoup half the cost of your recommendation just by choosing to order delivery afterwards, since by using NuggMD, you’re automatically credited with $20 to order from any dispensary found on Getnugg.com! So there you have it. While MMJ Doctor Online has certainly served a number of patients seeking doctor recommendations for cannabis, we aren’t quite convinced they do so in a legal, friendly, or efficient manner. But we’ll let you be the judge of that. 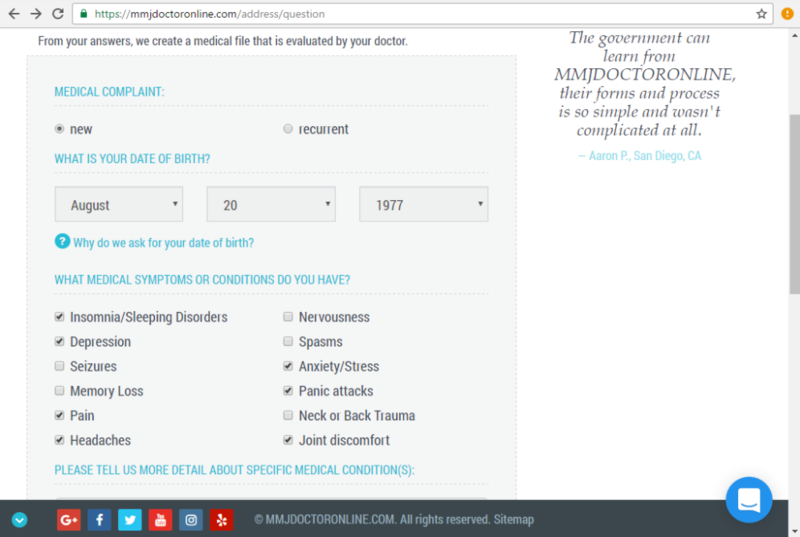 mmjdoctoronline.com also known as 420evaluationsonline.com both scam. When I got mine, there was no doctor interaction, and my paper recommendation arrived in 3 days with a seal. Not a foil sticker, but a raised stamp, like they have to put the paper under it and punch it like a stapler or hole punch. All the dispensaries I’ve tried have accepted it. That’s 3 in Cali and one in Nevada.